The Breyers® Blasts!™ line also includes family favorites, REESE’S® Peanut Butter Cups5, SNICKERS® Caramel Swirl Chunk6, OREO® Cookies & Cream and Heath®7, all with updated package designs. 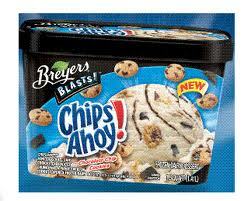 The Breyers® line of flavors is available nationwide for a suggested retail price of $3.50-$4.99." "This summer, Popsicle® is introducing two new varieties of colorful, refreshing ice pops that are sure to be a hit from family picnics to soccer practice. Following an extremely successful partnership last summer, Popsicle® has teamed up with Jolly Rancher® to introduce new Popsicle® Jolly Rancher® Awesome Twosome ice pops featuring the same bold fruity flavors that kids know and love from Jolly Rancher®.8 At 45 calories, each pop is made with 10% fruit juice, is fat free, and provides 10% of the daily value for vitamin C per serving. 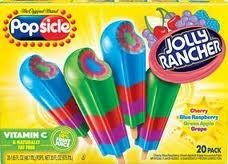 This 20-pack of refreshing treats includes two flavors in each pop: Blue Raspberry/Cherry and Grape/Green Apple. Popsicle® is also partnering with AirHeads®, the classic, taffy-like chewy candy, to introduce Popsicle® AirHeads® ice pops.9 Featuring the chew-tastic texture and flavors of AirHeads® candy, each fat-free ice pop contains 50 calories (100 calories per two-pop serving) and is available in an 18-pack in Strawberry, Blue Raspberry, Watermelon and White Mystery varieties. Boxes of Popsicle®ice pops are available in grocery stores nationwide for a suggested retail price of $4.49." "Between yard work and cleaning the pool, the “man of the house” will enjoy kicking back this summer with the new bar and sandwich offerings from Klondike®. Klondike® has added a new flavor twist to its line of iconic stickless bars with the Klondike® Mint Chocolate Chip bar. This tasty treat, available in grocery stores nationwide, features mint-flavored light ice cream with chocolatey flakes and dark chocolate flavored coating. Klondike® has 12 total varieties of stickless bars six-packs – including flavors like Caramel Pretzel (now with more caramel), Krunch, Dark Chocolate and Double Chocolate – made with a delicious, creamy light ice cream. 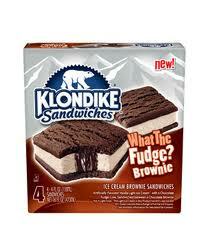 Expanding on its line of ice cream sandwiches, Klondike® is also introducing the What the Fudge? Brownie ice cream sandwich. This treat features artificially flavored vanilla light ice cream with a chocolate fudge core, sandwiched between a chocolate brownie. Best known for the single-serve offering, Klondike® is now bringing the popular Choco Taco® multipack to grocery stores nationwide for the first time. This cool taco features artificially flavored reduced fat vanilla ice cream with a chocolate flavored swirl in a sugar taco with milk chocolate flavored coating and peanuts. Klondike® stickless bars are available in six-packs and sandwiches and Choco Taco treats are available in four-packs, all for a suggested retail price of $4.19." What we thought: This review was a no-brainer:) The entire family LOVED all of these products! The kiddos especially loved the fruity flavors of the Popsicles, while B and I preferred the Klondike and Breyer's, but they were all a super tasty way to cool down this summer! The new varieties of these old favorites are an appealing and refreshing way to get a little relief during these brutal triple digit days. Unilever has done a great job improving all three of these brands:) I know my kiddos will be excited to have these treats as a yummy after-school snack:) ABCD Diaries gives Popsicle, Breyer's and Klondike an A+! Buy It: You can find these delicious treats at grocers and mass merchandisers nationwide! Win It: Unilever has generously offered one ABCD Diaries reader 5 free product coupons for Popsicle, Klondike and Breyer's!! To enter, follow our blog via GFC and comment below. I entered your Energizer iTunes giveaway. I entered your Something Borrowed DVD giveaway. I entered your Robert Rothschild Farm giveaway. I entered your maamam aacua apron giveaway. I entered your Snikiddy Snacks giveaway. I entered your Tupperware Rectangular Keeper giveaway. I entered your Do You Bake? giveaway. I entered your Mother Goose Club giveaway. I entered your Batter Blaster giveaway. I entered your Lay's Regional Chips giveaway. I entered the I See Me! giveaway. Hey I am your newest follower :) would be so happy if you could follow me back as well thanks so much, have a great day!! I would like to win these for my daughter who loves Klondike bars. Oh yummy!! These would be perfect for this hot summer weather! I entered the Tupperware giveaway! I entered the Do You Bake giveaway! I entered the Batter Blaster giveaway! I entered the Lay's giveaway! I entered the Matt's Munchies giveaway! I entered the Protein Bakery giveaway! Following on GFC - Gina F.
I entered the Mother Goose Club Prize Package Giveaway. I entered the Coleman giveaway.